Purchasing the Topps Baseball Complete Set is an annual ritual for many. And this year, Topps is taking that tradition and adding a twist. To commemorate the 2004 All-Star Game, Topps will offer the 732-card 2004 Topps Complete Set in a special Houston Astros Box. Not only will the box include images of Houston's brightest, but will also include 5 exclusive cards featuring top Astros Prospects. The set will be offered at this weekend's MLB All-Star FanFest in Houston, TX, but is also available at www.topps.com and at selected retail outlets. 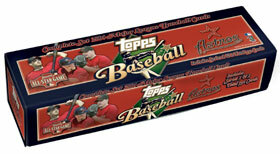 Topps is also offering three other Commemorative Complete Sets - New York Yankees, Boston Red Sox and Chicago Cubs. Each of these sets will also include 5 exclusive Prospects cards. Houston Astros Box: Brooks Conrad, Hector Gimenez, Kevin Davidson, Chris Burke and John Buck. New York Yankees Box: Rudy Guillen, David Parrish, Brad Halsey, Hector Made and Robinson Cano. Boston Red Box: David Murphy, Kevin Youkillis, Juan Cedeno, Matt Murton and Kenny Perez. Chicago Cubs Box: Bobby Brownlie, Felix Pie, Jon Connolly, David Kelton and Ricky Nolasco.